I hope you have a very fun, but safe 4th of July. I decided I better post the rest of my Patriotic decor. I love this cloche. I did one pretty similar last year. But this year I added a couple of flags that I stuck in a bottle hiding behind the patriotic print. And yes, those are real fire crackers. But they are just for show. We don't light off illegal fire crackers at our house. At least I don't. This box usually sits up on top of my kitchen cabinets. On the back side it has writing that says something about a snowplow insert. That is the side that you usually see when it is on my cabinets. Only once a year does it get to turn around & show off it's patriotic side. My sister in law painted the stars and stripes a long time ago for me. I filled it up with patriotic items. Including a star I made from a folding ruler. And a Liberty Blue plate. Another tin star and some flags. I've already shown you my Patriotic bear knock off. But he is so cute he is definitely worth a second looksy. I made this flag finial last year. I found the fence top at a thrift store. Painted it white, got hubby to drill a few holes, added some flags, and instant flag finial. Fast, cheap & easy. My kind of project. I had more cloches to fill on my trunk. This patriotic creamer was a thrift store find a few years back. The star came from Tai Pan Trading this year. And to the owners of Tai Pan Trading, you definitely need to expand into other states. You'd have lots of buyers if you did. The Uncle Sam boxes came from Michael's last year or the year before. I made the patriotic fan with the help of Martha Stewart. We are best buds. She just acts like she doesn't know me. But it is all a ruse. The shelf in my family room. Added a few tin stars. Then I dressed up an old vintage bottle to look more patriotic. Hung a star ornament from one of the bottles that reside on the shelf. Added a patriotic sticker to the middle of the lollie and the shelf was done. Even my kitchen got a little patriotic pick me up. 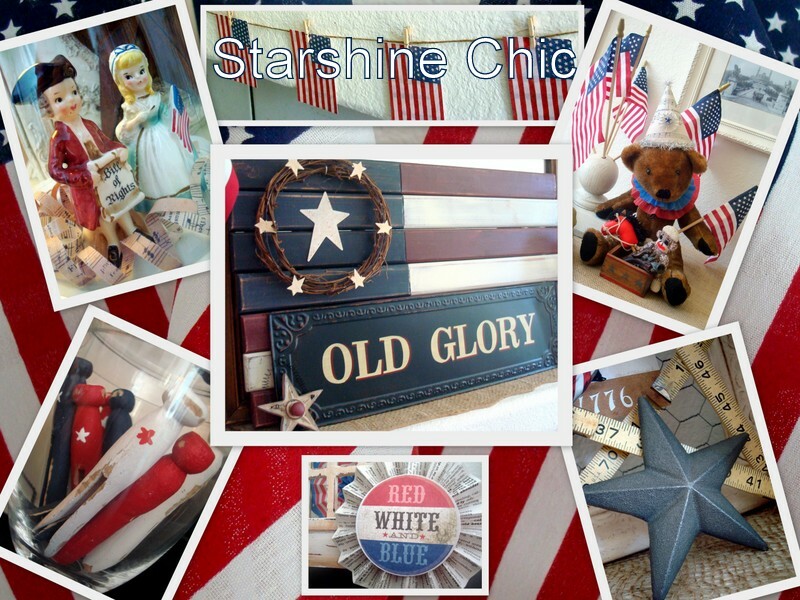 I added a couple of vintage patriotic Avon plates and another flag banner that I made. And I finally found me some of these plates. I've been wanting them for 3 years. I found them this year at Victorian Trading Co. But they are too tall to fit on my hutch. Boo hoo! And I was totally going to make a tablescape with them, but I was too lazy. Maybe next year. So what are you doing to celebrate the 4th? We are having some family and friends over for our annual pool party/BBQ. I spent all day cleaning house. My neighbor (who is coming to the party) asked me "Why?, Everyone is going to be outside, why bother cleaning the inside?" I told her, I need a reason to clean my house at least once a year. Just kidding. No I'm not. Yes I am. It's suppose to be over 100 degrees here in SoCal tomorrow. So the pool is the perfect spot to be. But I need to remember to put on sunscreen. It seems we started our 4th of July celebrating a little early yesterday & I got a wee bit sunburned. Thank heaven for Aloe Vera spray. It saved me from pain. Happy 4th! And don't get sunburned. Beautiful post! So patriotic decor! The blue-red-white combo looks fantastic here. Thanks for sharing. Lovely space you got here. Such a great post! Hope you had a lovely holiday.